The MINI-PLS, models M1450 and M1451, are the fastest and most versatile PLS family in the market. We call it Mini because of the small compact size, but it is big in performance. In fact, MINI-PLS is three controls in one: Programmable Limit Switch, Tachometer, and Motion Detector. The powerful microprocessor and the revolutionary design make MINI-PLS an extremely compact, fast and versatile solid-state replacement of electromechanical cam switches. The M1450 MINI-PLS features a rate offset to compensate for speed variations. This rate offset represents a positive number that varies linearly with RPM. This number is added to the resolver position and is used to advance the PLS settings as a function of the machine speed. Depending upon the selected model, you can program a single rate offset value for a group of 8 channels on a cam module or different rate offset values for up to 16 individual channels. The M1450 MINI-PLS features dynamic zeroing or ModZ (Modification Zero) to modify the zero reference point for selected group of channels independent of the actual resolver position. Upon receiving an external signal, the resolver position for the selected ModZ channels is reset to zero. Thereafter the position is incremented as the resolver rotates forward and outputs are turned on and off at the programmed limit settings. This feature is ideal for gluing applications, where the glue-gun must be activated at a certain position after the detection of an upcoming product. Depending upon the selected model, you can operate up to 4 ModZ cam modules or 32 outputs. This is a semiabsolute position programmable limit switch that uses a single-resolver as input and has a maximum resolution of 4096 counts-per-revolution. This model is a multi-turn unit that keeps track of number of revolutions and accumulates its position as the resolver shaft rotates. The maximum read out is 999,999. The position is retained on loss of power provided the resolver shaft is not rotated more than 180 degrees while power is off. A preset input is provided to enter a preset number into the memory as a reference position. The ModZ trigger and ModZ enable inputs allow ModZ functions for up to three cam modules. Speed compensation is also provided for all cam modules installed. The multi-turn (dual) resolver MINI-PLS models D64 and D128 resolve the position of a rotary shaft up to 4096 counts­per-turn. These systems, utilizing dual resolvers with built-in precision gear train, are fully absolute and keep track of the shaft position as well as number of turns, regardless of power failure, up to 64 and 128 turns respectively. The linear MlNI-PLS, model LTO, decodes the linear movement with 0.00 1 " resolution and up to 108 " of travel. This unit utilizes an ultrasonic transducer to monitor the linear position of a machine by the movement of a 1.3" (33.02 mm) diameter magnet ring over a 3/8" (9.53 mm) diameter stainless steel rod. The transducer is connected to an interface box, which is mounted a few feet away. The linear PLS can be mounted up to 1000 ft (304.8 m) away in a safe control room environment. In addition, a calibration provision eliminates the need to physically match the decoder to the rod, a problem encountered in earlier controls. The maximum TRUE position ranges up to 108,000 counts but it can be offset to 524,287. ModZ function for up to two cam modules is provided. Tach or speed compensation is not available. Instead, the M1450-LTO provides a direction signal that is on for increasing position and off for decreasing position. The basic MINI-PLS unit with its sealed front plate is designed for front panel mounting. It has T- (5 V, TTL), P-, or N-type (50 V DC @ 100 mA) outputs for light loads or PC interface. For higher voltages and currents, Power Cam Modules or remote power output chassis are available. The MINI-PLS can also be purchased in a back panel mount ver­sion with built-in power relay output chassis. This back panel model can be mounted either inside the user control panel or in a NEMA 12 (IP52) enclosure available from AVG Automation. Model M1451-010 PLS is an absolute position resolver which accepts input from a single-turn Resolver. It combines a PLS, tach, and motion detector and features a built-in broken-wire detector. It also has MODZ, speed compensation and brake­wear monitoring capability. 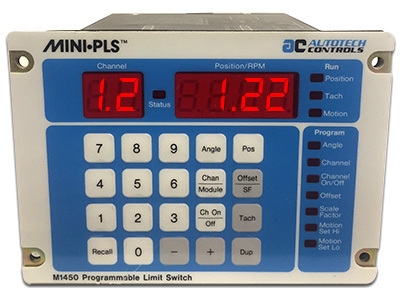 At 1800 RPM the micro-scan time is rated 450-905 µs.